This is about LetsEncrypt, JupyterHub and Tomcat. I built my JupyterHub server on a quad-core xeon 1U ‘pizza box’ server I had spare. It’s short on memory because this generation HP Proliant server maxed out at 8gig, so that’s all I can put in it. Still, it works and is a good demo platform for JupyterHub and my Java course revision project. JupyterHub really wants to be running as secure HTTP (HTTPS) with a proper certificate. I put the server on a different port (not 443) but can still reach it from my domain, using packet-filter redirection in my firewall. But – it wants that proper certificate. Typically one would just create a ‘self-signed’ cert using Java’s keytool and use that for Tomcat, but Jupyter wanted something else. Fortunately I found enough documentation and tutorials to enable me to install and generate a LetsEncrypt (free) certificate that worked perfectly with JupyterHub. There were issues, mostly involving the need to create the certificate manually, but once these were resolved it worked perfectly. This past week I wondered “could I use the LetsEncrypt certificate with my Tomcat application?”. I searched the web, and found several rather conflicting accounts of how to do it. I tried a few, and all failed. Eventually I found one that started with “forget all the difficult stuff you’ve read. Installing a LetsEncrypt ‘pem’ file into a Tomcat keyfile is easy. Here’s how…”. I followed that two-command process, and was immediately rewarded with full certificate security for my Tomcat application, WITHOUT having to create a browser exception for the certificate. I’m rapidly on my way to becoming an old codger. This Christmas Break I soldered together a couple of hardware kits that emulate some old and older computers. One was an Altair 8800 copy, which in it’s day was one of the very first “personal computers” ever sold. The other kit was a PDP11/70 replica, which was some of the first “big iron” I ever programmed on. Now as testiment to my codgerhood, my first computer experience was at the UofC on a CDC Cyber 170, followed by the Honeywell Multics system that replaced the CDC at the UofC a few years later. My first job post-graduation was at a company using two IBM 3033 mainframes, each of which filled a large room. The laser printer filled an equally large room, but that’ another story (it was VERY fast). From there I worked with various other systems, including the above (actual) PDP 11/70’s and even at one point some time on a Cray YMP. But this isn’t about “bit iron”, it’s about the personal computer. My first was a TRS-80 Model I. I bought a silk-screen expansion board, sourced and soldered it together as I could not afford the “offical” one. Later I bought a TRS80 Model III, then the 4 and finally a Model 4P, which I still have complete with all manuals and software. But in amongst that time came the IBM PC. It changed the world simply because it was IBM and it seemed *everyone* (or every company) bought one. I never owned an IBM PC, nor a clone PC. My first forray into “modern” (i.e. post-IBM) PC ownership came when Tandy brought out the Model 2000. This was based on the 80186 chip, which was a “hybrid” – not an 8086 and not an 80286, but something in between. It was a great machine, and much more affordable (for the time) than a “286”. As I struck out on my own consulting, I bought one of the newest “386” machines, and it cost me $6000. But for the time it was the greatest, fastest machine you could buy. I lived, worked, and owned PCs through the 486 era, and into the “Pentium” machines. By then the operating systems were firmly Windows based. I skipped Windows 1 through 3, but at Windows 3.1 it finally came into it’s own. Windows for Workgroups (WFW 4) was a really nice system at the time, and I did quite a bit of work on it. Then came Windows 95, which “changed the world”. Certainly it brought the internet to the common computer owner, as well as a pretty decent OS. Buggy, but decent. Then came Windows 98 and Windows ME (pronounced “meh” – as in “what the hell is this piece of crap???”). By then I’d gravitated to Windows NT, which had one great feature – it worked and worked well. Through this we had Pentiums. They got faster, but they were Pentiums. Eventually sometime after 2000 Intel started putting out the I series – I3, I5, I7. Each one had more cores and was faster than the predecessor. AMD also had multi-core chips, and there was, for a time, a nice “arms race” of computing horsepower. At the end of April, 2012, I built my current PC system. It uses an Intel Quad Core i7 3770K, Asus Sabertooth Z77 ATX motherboard, 16GB of RAM, a couple of fancy graphics cards, a fancy case with water cooling, 2 x SSD hard drives and a Blue Ray writer. All state-of-the-art for early 2012. I bought the components and assembled it myself, and it was (and is) a very nice system. It was also considered very fast and high performance. That particular Intel I7 (3770K) was quad core, and fast. But what I’ve noticed since then is… nothing. I *think* you can buy processors with more cores, and probably faster ones, but today I realized that although I still get tech-type feeds, I haven’t actually heard much in the past few years about “newer, faster, better” processors. It’s as if we’ve exhausted that particular line of “faster, better” in personal computing. I suspect that for 99% of the market, ANYTHING you buy today is plenty fast enough. The other 1% is gamers, and perhaps if I got gaming feeds or magazines I would hear more about “faster gaming machines”, but I do wonder. Have we really reached the end end of the “faster, better” in computing hardware? I also wondered; if I wanted to find out what the FASTEST computer you could use today, how would I even go about finding it? Yea, there’s “the google”, but I’ve also started noticing that between all the “targeted results” based on what you like, it’s getting harder and harder to find any REAL information on the internet these days. <sigh> I guess I really am becoming an old codger. I bought a couple of Vintage Computer replica kits in the summer, but did not have time to work on them due to home renovations. One kit was a replica PDP11/70, the other a replica Altair 8800. I decided that they would be perfect “Christmas Break” projects and so kept them until then. Over the Christmas Break, I got them out and started building them. 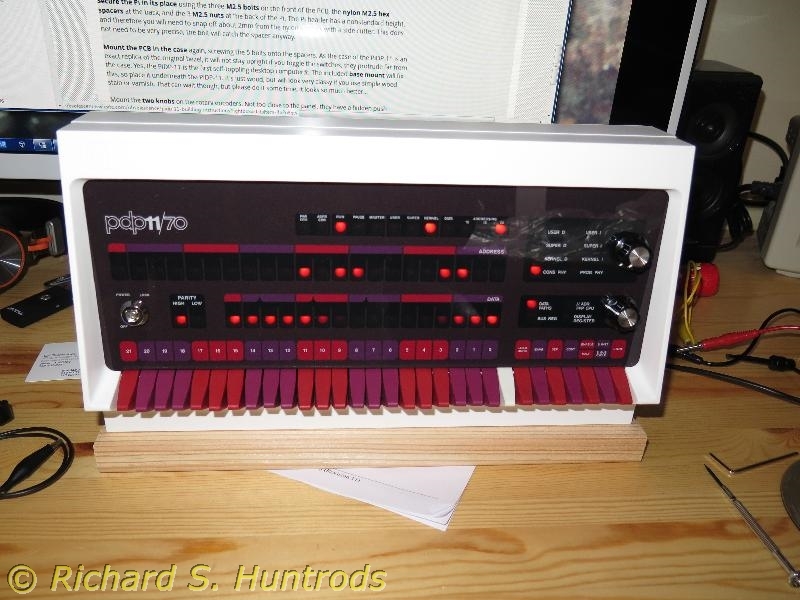 I started first with the PDP11/70 kit, or PiDP11 as it’s called. It features a manufactured plastic case and switches that create the complete look of a vintage PDP11/70. There is also a front panel and professional grade circuit board and all the components (switches, resisters, LEDs, diodes, etc.). The kit uses a Raspberry Pi (Model 3B recommended) running software called simh to drive the replica. Basically you run the Pi’s Linux and simh runs as a process on top of that – reading the switches and driving the LEDs. The kit was straightforward to solder together, and ended up taking most of one afternoon and evening to build. When complete, it looks and works very much like the PDP11/70’s I have used in the past, minus the loud whirring noise of the giant disk packs and fans. The second kit was the Altair 8800 replica, which again featured a case (bamboo this time), front panel, circuit board and the bags of components. 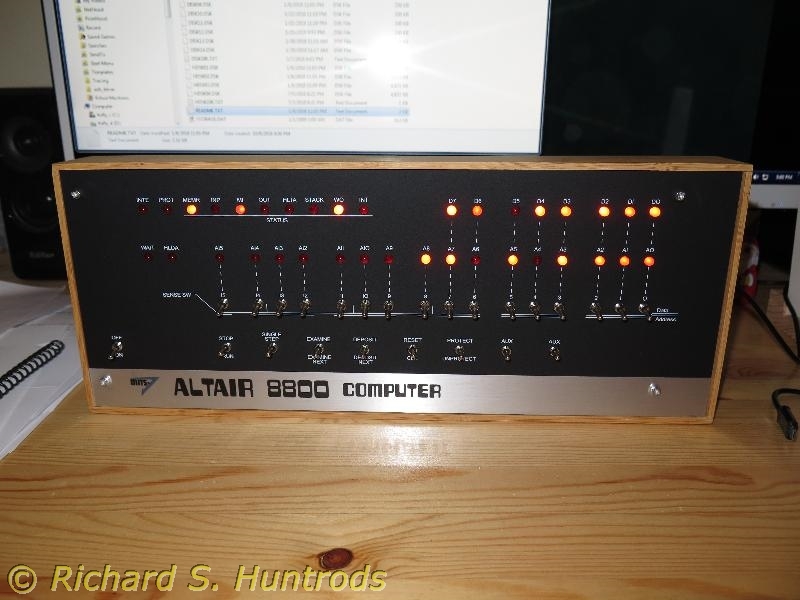 The Altair 8800 emulates the 8080 of the early computer days using an Arduino Due, rather than a Raspberry Pi. This kit was more complex, and took an entire day to solder together and assemble. I had a few initial issues with the Altair kit, as it features a bluetooth serial port as well as an SD card reader to hold various “disk pack” images. At first I could not get either the bluetooth nor the SD reader working. Some email discussion with the kit designer indicated the bluetooth card, though powered, was not initialized unless you manually configured it in the software setup. Once done, the bluetooth works perfectly and has become my preferred communication channel with the replica. The SD reader was more interesting, in that the metal ‘can’ protecting the pins was bent, preventing full insertion of the SD card. Once that was fixed the SD reader worked perfectly, as did the replica. It’s been fun keying in a few simple programs into both replicas using the front panel switches, but the real power comes from all the operating systems both replicas support. The Altair 8800 replica, or “AltairDuino” offers CPM, Altair DOS, many games and other amusements. The PiDP11 offers RTS11, BSD 2.11, 3 flavors of Unix and a real-time OS once used in SCADA industrial control. I really enjoy playing with these old machines. Given the current state of obsolescence and the love of many to consign everything unwanted to dumpsters, I’ll likely never own full-size originals, but these are a lot of fun.